Tina has proven her place in the show ring, always giving 110% and always putting on a show. 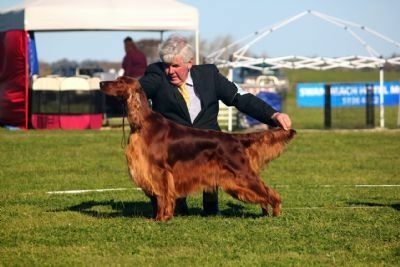 Tina has continued to be extremely successful after her puppy career she has become #1 Irish Setter in Australia* for multiple years running. Tina is a multiple winning Best in Show All Breeds and Specialty winner. Also, Tina has shown been sparingly shown in 2014 and still continues as a constant contender in the Gundog Group each time she is shown. We look forward to what Tina still has to bring to the Eireannmada team.